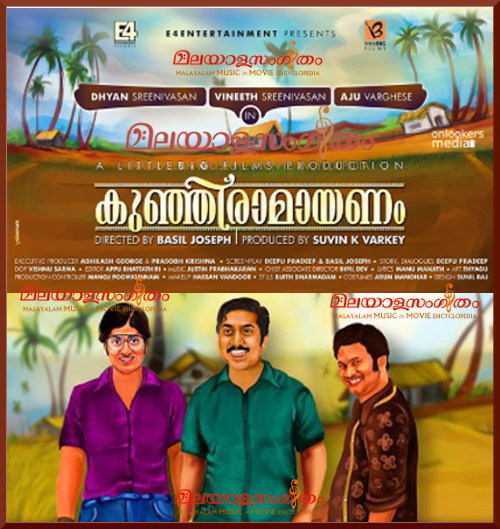 For a movie made in apparently retro settings, songs from Kunjiramayanam don’t carry that flavour much, and have a rather high presence of electronic elements. Paavaada is the track that conforms most to a yesteryear setting; Manu Manjith’s lines beautifully convey the childish fantasies, composer Justin Prabhakaran’s tune and arrangement are simple and folksy (lovely use of harmonium). The rendition by Daya Bijibal (composer Bijibal’s daughter) is immensely endearing, only marred a little by the processing. The movie’s mainman Vineeth Sreenivasan is behind the mic for Ayyayyo Ayyayyo, a wonderfully executed mock melancholic piece. The shehnai (or naadaswaram?) is employed excellently, constituting the pathos element in an otherwise buoyant techno-based arrangement. The other half of the soundtrack doesn’t fare so well. Thumba Poove Sundari has Shankar Mahadevan on vocals, who is energetic as always. The song has a rather ordinary tune though, one that the arrangement or the singing are not quite able to make up for. Salsa has Masala Coffee members on vocals and starts off promisingly with a folk-tinged tune but drops off pretty soon. Justin’s arrangement does get interesting in the interludes however, so that is something to look out for. Kunjiramayanam. Two out of four. Justin Prabhakaran’s Malayalam debut is passable.